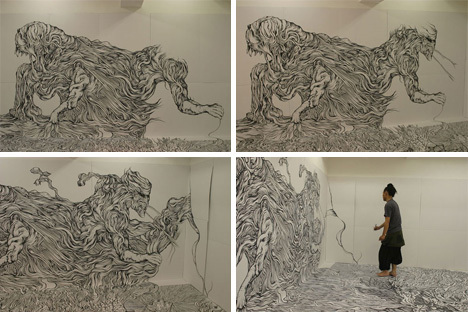 We all know that drawing on the walls is a big no-no – well, at least according to parents, school officials, bosses and landlords – but artist Yosuke Goda has elevated wall drawings from mere scrawlings to fine art. Goda’s incredibly intricate drawings cover entire rooms, including the floors, and create fantastical worlds we can’t help but want to jump right into. 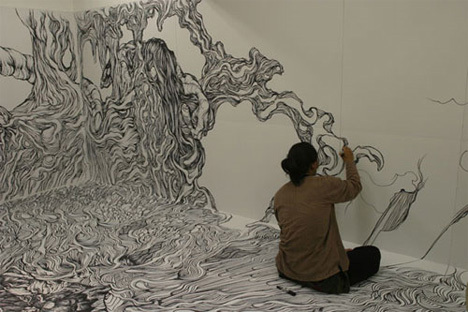 Tokyo-born Yosuke Goda specializes in larger-than-life drawings rendered in thick black lines. 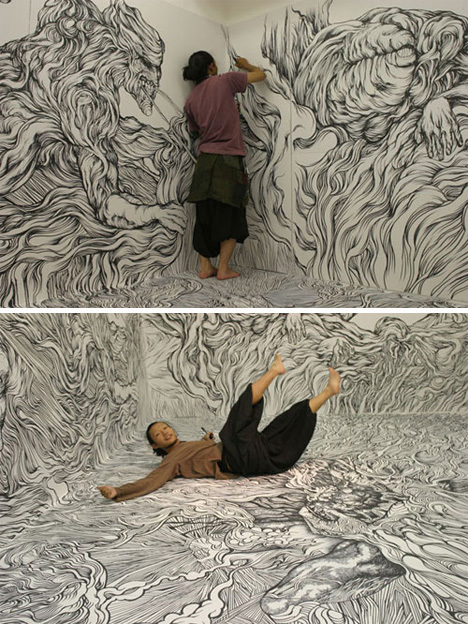 He enters a room that has blank white walls holding a black marker and begins bringing to life the detailed scenes. The drawings seem to grow organically, beginning at the point where marker first touches wall and blossoming out in every direction. Soon, the curves, swirls and lines cover every reachable surface. Only the ceiling is left bare. The work often looks quite serious, depicting battling beasts and terrifying creatures, but Goda imparts a fair amount of playfulness and humor into his art. As he draws he seems to almost dance around the room, enjoying his creations nearly as much as his viewers do.